Much like Wolverhampton Wanderers, Fulham sauntered into the new Premier League season with loftier ambitions than merely avoiding relegation straight back down to the Championship. Bankrolled by £100million from American owner Shahid Khan’s, Fulham launched an all-out assault on the transfer market over the summer, attracting high-profile players such as Jean Michaël Seri, André Schürrle and André-Frank Zambo Anguissa to Craven Cottage. That wasn’t all. Aleksandar Mitrović, whose goals on loan in the second half of last season propelled the club to promotion, was captured on a permanent basis, while Sergio Rico, Calum Chambers and Luciano Vietto were among those who joined loanee Schurrle. Back in the top flight after a four-year absence and with a raft of exciting new faces to complement more established first-teamers like Ryan Sessegnon, Tom Cairney and Tim Ream, there was a palpable sense of anticipation as the new season dawned. Three months on, however, and that excitement has been replaced by a deepening malaise, one that has afflicted the club to a point where Slaviša Jokanović is now flirting dangerously with becoming the first managerial casualty of the 2018/19 Premier League season. It wasn’t supposed to be this way. This year promised to be Jokanović’s redemption. Having guided Watford to promotion in 2015, the Serb left Vicarage Road before a ball was kicked in the new season after failing to agree a new contract. This summer, thankfully, saw no such upheaval. Having gained Khan’s trust, Jokanović was tipped to lead Fulham’s bolstered ranks through an exciting return to the Premier League. Instead, with one win and five points from 11 games, the 50-year-old finds himself staring into the abyss with Fulham sliding back towards the second tier. With back-to-back defeats to Crystal Palace and Tottenham Hotspur, their initiation was admittedly far from smooth but, after a midfield masterclass from Seri guided them to a thumping 4-2 win over Burnley, things seemed to be on the up. Since then, however, Fulham have managed just two points from a possible 24, a miserable run in which they have shipped three or more goals on five occasions. And while losing to Arsenal and Manchester City is hardly degrading, squandering the lead to eventually lose 4-2 to then-winless Cardiff City laid bare the scale of the task facing Jokanović. Intriguingly, he is no stranger to pressure around this time of year. Last season, a six-game winless streak left Fulham languishing down in 17th in the Championship with Jokanović fighting for his job. Luckily, a stunning 5-4 win over Sheffield United proved the turning point but it’s difficult to imagine them engineering a similarly stunning resurgence in the top flight. And, following their latest dismal defeat, to Huddersfield Town on Monday night, the club’s supporters are entitled to ask how dreams of becoming the next Bournemouth have been replaced with a genuine fear that this season may produce one of the most expensive relegations English football has ever seen. Let’s start with the signings. For much of his time at Craven Cottage, Jokanović has both overseen matters on the pitch while vexing at matters off it. The summer of 2017 brought much frustration as Jokanović became locked in a power struggle with CK, the man in charge of Fulham’s transfer business. Marginalised and frustrated, Jokanović often cut a gloomy figure in press conferences when asked about recruitment, but when K was sacked last year and Jokanović was afforded more power, he combined with the owner’s son, Tony Khan, data analyst James Lovell, chief scout Brian Talbot and chief executive Alistair Mackintosh to plot the Fulham of the future. Crucially, though, while Jokanović’s input was heard, the overall responsibility still fell on the higher-ups. But they initially seemed to deliver. In Seri, they got a player who last year was a Barcelona transfer target, and Schürrle, a proven German international who can rightfully claim to have created a World Cup-winning goal. Between them, they have five goals, with Mitrović adding a further five (although the Serb has gone five games without one). No, Fulham’s problems lie further back. Twenty-nine goals conceded from 11 games is a shocking return. The departure of Ryan Fredericks, who excelled at right-back last season, has been felt while the failure to land Matt Targett on a permanent basis following an impressive stint on loan last season will have surely disappointed the manager, particularly given how much their full-backs provided in both attack and defence throughout their promotion bid. But it’s important to note that, while he may not have had as much say in transfers as he would have liked, Jokanović’s inability to tighten things up at the back is alarming. Conceding goals at a current rate of 2.64 per game, continue at the same rate and the Cottagers will concede 100 by the end of the season. Alfie Mawson and Joe Bryan’s campaigns have been hampered by injury, too, but whatever sympathy Jokanović may attract is negated when you consider that he dropped Marcus Bettinelli for Rico just a couple of days after the England goalkeeper’s contract extension was announced. Despite what some people may think, Jokanović did not spend £100million, but his job still requires him to integrate the new signings into the squad, establish a clear identity and show signs of progression. His constant chopping and changing has bred instability while his philosophy of possession-based football has been easily found out by slicker, more organised Premier League sides. Even against Huddersfield, who hadn’t scored a goal at home in 205 days, Jokanović seemed hopelessly out of reach of the ‘solution’ which he has regularly referred to during this disastrous run. Having failed to register a shot on the Terriers’ goal, he made two substitutions at half-time, suggesting that not even he was fully confident in the team he’d sent out. Managers with limited control over transfers often grow disgruntled and, with their form on the slide, Jokanović’s future at Fulham appears bleak, particularly with visits to Liverpool, Chelsea and Manchester United to come in their next five league outings. Perhaps Jokanović did not get the players he wanted but his attempts to establish a working formula have so far been scattergun, confused and hugely ineffective. There is no one person to blame. Individual errors are a player’s error but Fulham’s muddled approach on a weekly basis this season must come back on the manager. He is not the only one to blame but will almost certainly be the first one to go. We don’t want to discuss last night’s horror show too much, but it’s pretty clear a few things need to be changed in terms of personnel and shape. or us, we think Liverpool simply have to return to a 4-2-3-1, which saw us score eight goals against Red Star and Fulham, before we changed back to the 4-3-3, which has seen us draw to Arsenal and lose to the Serbians. We’d stick with Alisson in goal, although do think he could have done better for the second goal last night. Trent was horrible at right-back, but should keep his spot at right-back, with Robertson on the left. Van Dijk and Gomez should play at the back. In midfield, James Milner and Adam Lallana simply need to step out following their recent outings. We’d also pull Gini Wijnaldum out of the team in order to use Naby Keita and Fabinho as a double pivot. It’s a formation both are comfortable with, although we’d be fine with Wijnaldum taking one of the roles instead of the one of the new signings. On the right Xherdan Shaqiri is a must in a free role, with the usual front-three sure to benefit from his creative spark. 2018/19 Members can now purchase up to four tickets each for the Whites' home match against West Ham United. Join us for our third home London derby of the 18/19 campaign on Saturday 15th December, with kick-off at Craven Cottage at 5:30pm. Tickets are priced from £30 adults and £20 juniors and are available online, by phone on 0203 871 0810 or in person from the Fulham Ticket Office. Season Ticket Holders will be able to purchase up to four additional tickets each from 10am, Friday 9th November. Full pricing and selling arrangements can be viewed here. Supporters are advised that any Memberships must have been purchased before 10am on Tuesday 6th November to be eligible to purchase tickets to this fixture. Fulham Football Club and ProgrammeMaster are teaming up to support the second annual FFC Foundation Matchday. On Saturday 24th November, £1 from every matchday programme purchased will be donated to FFC Foundation. The Club will donate 50p per programme sold, matching donations made by ProgrammeMaster, totalling £1 donation at no extra cost to supporters. The match will highlight the Foundation’s work in the local community. Slavisa Jokanovic was due to hold talks with members of the Fulham hierarchy on Wednesday about how he plans to instigate a revival at Craven Cottage. The Serb has regular discussions with director of football operations Tony Khan and chief executive Alistair Mackintosh at the club’s training ground — and Jokanovic was set to speak to them today ahead of Sunday’s trip to Liverpool. Jokanovic has been given no indication that he will be sacked if Fulham lose at Anfield and he is hopeful he will be given more time to turn things around. The 50-year-old is under growing pressure and admitted his job is at risk after Fulham dropped to the bottom of the Premier League table after losing 1-0 to Huddersfield on Monday. It is understood Jokanovic has not spoken to owner Shahid Khan this week — although that is not unusual in itself — and he believes he maintains the backing of the Fulham board. Khan Snr issued a public show of support for Jokanovic last month and the American billionaire has a history of being patient with managers. Jokanovic was back at club’s training ground on Wednesday after giving the players Tuesday off. He, Khan Jnr and Mackintosh have offices next to each other, so are in regular contact. Jokanovic admitted on Monday that his job is at risk after five straight defeats but he is hopeful the tough trip to Liverpool this weekend will not be make-or-break. He is planning for the upcoming international break and beyond that, although he is aware the situation could quickly change. Jokanovic is convinced the players are committed, despite their abject display against Huddersfield, but he feels the lack of Premier League experience in his squad is not helping. He urged Fulham to sign players with Premier League experience in the summer, but does not have the final say on new arrivals. Fulham spent more than £100million following their promotion, but only five of their 12 new arrivals had previously played in the English top-flight. Signings are identified by the club’s recruitment department, which is overseen by Khan Jnr. He is assisted by chief scout Brian Talbot and data analyst James Lovell. Jokanovic is involved in the process but not all the players were his choices. Jokanovic was happy with the £25m signing of Jean Michael Seri but knew he, along with £30m signing Andre-Frank Zambo Anguissa, would need time to adjust to English football. Jokanovic said after the Huddersfield game that too many Fulham players are playing with fear and it is understood this week he will urge them play with more “personality” against Liverpool. Eleven games into our first season back in the Premier League and things are not going to plan. Any thoughts the Fulham faithful had of enjoying a season where more than consolidating our top-flight status would be something to behold have been blown away by our current plight which sees us lying at the bottom of the Premier League table. Those aforementioned eleven games have yielded just one win and a paltry five points, which even to the most loyal of supporters would suggest we face a relegation battle. Hopefully, our fortunes will change this weekend when we play the twelfth fixture of the campaign, but I wouldn’t hold out too many hopes. If we can’t get a result away to a Huddersfield team that, before they played us, hadn’t won all season, what hope have we of getting a result against a side that are unbeaten in the Premier League this season, Liverpool? But, perhaps the time is ripe for a shock, perhaps a few harsh words exchanged in the dressing room and on the training pitch, could see things change dramatically. Fulham have reportedly made an attempt to sign Chelsea midfielder Tiemoué Bakayoko . in ‘recent days’. It’s the Italian press who’s reporting it today, with Calciomercato saying the Whites are keen on getting the 24-year-old on a loan deal from the Blues. Problem is that Bakayoko is currently having a loan spell at AC Milan, and the website claims that although he hasn’t been impressing in his first months at the Serie A club, it’s unlikely that he would leave in January. Milan will still be patient and give time for Bakayoko to prove himself. Especially because they’ve already paid €5m for the loan, and have until the summer of 2019 to activate the €35m buying option which is included in his contract. The opportunity of making money with the sale is also good for Roman Abramovich. That’s why he wouldn’t like the idea of stopping the loan to send him to their West London rivals. Bakayoko claims have been frequent in the Italian media, with some reports in recent months that Milan would be keen on him leaving sooner rather than later. Fulham may have been brought in as another angle to the story, but Calciomercato make it clear this claim is from their own information. Full-back Fredericks helped the Cottagers to promotion from the Championship last season before opting to move across London to West Ham in the summer. That currently looks a wise decision after Fulham slumped to the bottom of the table following Monday's 1-0 defeat at Huddersfield. "When he came in we were sitting near the bottom of the Championship, he came in and transformed the club, so I think 100 per cent he deserves to stay and hopefully he will turn things round," Fredericks told Press Association Sport. "I'm surprised, but they've got what it takes to get out of trouble and I really hope they do. They've got enough quality in the team, it's probably just a big learning curve for them. "It's different from the Championship, where we were having probably 70 or 80 per cent possession in games. Now you have to defend for your life. But I'm sure they're good enough to get out of it." Fredericks' West Ham career has got off to a tough start – his only three Premier League appearances so far came in defeats to Liverpool, Arsenal and Wolves. "I played the first few games and we were without a win so it was tough," Fredericks added. "But on a good note the team is doing well now and so it's a challenge for me to get back into the team. "Pablo has played at the top level for the last 10 years and probably been the best right-back in the league. I'm watching what he's doing from the bench and trying to bring that into my game." Fredericks, a former schoolboy athlete with a personal best over 100 metres of 11.01 seconds, is fittingly concentrating his efforts on the sporting programme. He said: "It's a great project, West Ham's a family club and I've been helping the young kids, coaching them in the athletics side of things which is great for me, to do a bit from my background and give a little back." It's safe to say the fans at Craven Cottage aren't too impressed. Fulham have responded to complaints over ticket prices for their upcoming Premier League clash with West Ham. The fixture, which is due to take place at Craven Cottage on December 15, will see supporters pay up to £75 for an adult ticket to the game. "Dear Fulham. Ticket prices for the home game vs West Ham. I can take the bad performances. But this? Still £55-£75 for a home game? "A plea to Fulham season ticket holders. You are needed to say: this isn’t on. This is not what my club stands for. Because, as we’ve seen so often before in football, if a club thinks they can get away with this, they don’t stop there." Justifying their position on ticket prices at Craven Cottage, a spokesperson for Fulham Football Club said: "There are various categories for match ticket prices in 2018/19 and these are balanced against other fixtures at Craven Cottage. The subject of ticket prices was a major topic of conversation when the Fulham Supporters' Trust met with the club as part of the ongoing structured dialogue between both parties last month. Disclosing what was discussed in the official notes from the meeting , the Supporters Trust confirmed that they had expressed concern that current ticket prices were too high and risked pricing out a generation of supporters. When met with the concern, Fulham's Chief Executive Officer, Alistair Mackintosh, didn't agree. Mackintosh stated that Shahid Khan still subsidises the business to a considerable degree and, given the long-term objective of making the club sustainable, revenue needs to be raised. Mackintosh also revealed that the club does not benchmark well commercially against comparative Premier League and Championship competitors - something which subsequently leads the club to seek revenue elsewhere. The ongoing friction surrounding ticket prices isn't only limited to match day pricing. Fulham increased the cost of their season tickets across the board after being promoted to the Premier League, much to the disgruntlement of their loyal fans. This topic was discussed in October's meeting with the supporters' trust, with Alastair Mackintosh saying that the club made a strong offer to the supporters which realised a 99% renewal rate. The club also confirmed that a number of options were being considered to reward the loyalty of season ticket holders, although no decisions had yet been made about pricing for next season. Dead last in the Premier League after 11 matches. Five straight league losses on the bounce. Dreadful defeats to previously-winless Cardiff City and Huddersfield Town. 29 goals conceded and a goal difference of -18. Fulham’s pathetic start to the season is clear for all to see and the club needs to make a change. Unfortunately, in modern football that starts with the manager. Despite Slavisa Jokanovic’s legendary tenure in SW6, he has proven himself incapable of performing in the top flight, and his time surely must be up at Fulham. Over the past months, the Serbian has undoubtedly been given an unenviable task, with a multitude of new faces arriving after significant player departures in the summer. Added to the debilitating slate of injuries that struck Fulham, it was a nightmare scenario for a manager. But despite all this Jokanovic has simply not been up to the job, harming the club with his questionable starting lineups, baffling bench selections, and odd substitutions. 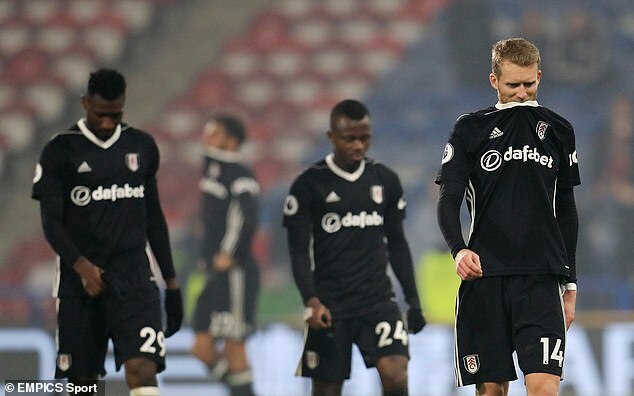 In Fulham’s abject performance at Huddersfield there was no coherent game plan, no fight from the players, and a complete feeling of helplessness. Monday’s match was surely the biggest game of Fulham’s season, yet the 4-3-3 system that had treated Jokanovic so well in the past failed him. Fulham rarely had sustained attacking possession, were beaten to every ball by the Terriers, and only managed two shots on target. The attacking options on the bench were non-existent. With Fulham chasing the match down 1-0, the best Jokanovic could do was throw on Cyrus Christie: there was no Aboubakar Kamara (possibly due to injury), no Floyd Ayite, and no Neeskens Kebano to choose from. And with the Cottagers desperately searching for a goal, last season’s top scorer Ryan Sessegnon remained stationed at left back. Some Fulham supporters have called for consistency and argued Jokanovic is still the right man for the job. This is a valid claim, and it was true after the Cardiff match. But one struggles to see how Fulham can pick themselves up and how the Serbian can turn things around after the horror show at Huddersfield. Defeats such as that can truly drain a team’s morale, and it is telling that Jokanovic could not find a solution after the Cardiff loss. Then, it felt like rock-bottom for Fulham. A new low was reached just a few weeks later. None of the current concerns should affect supporters’ overall views on Jokanovic. He joined Fulham Football Club at one of its lowest points in recent memory, arriving at Craven Cottage in December 2015 when the Whites were facing relegation to League One. From that point, he kept Fulham in the Championship, mounted a late charge the next season to reach the play-offs, did the same the following year, and brought Fulham back to the promised land while playing superb football. Jokanovic should be regarded as a club legend. Yet the unfortunate reality is that he is not a Premier League manager. The Khans must change things soon and bring in someone with top-flight experience who can right the ship on the banks of the Thames. Thanks for the memories Slavisa, but your time is up. he Chelsea midfielder was reportedly targeted for a mid-season move to London neighbours Fulham. Fulham have in recent days asked about a January loan deal for Chelsea's Tiemoue Bakayoko, according to Calciomercato. Bakayoko is currently on loan from Chelsea to AC Milan, where his performances have been described as being 'not to the best of his ability'. But the Italian newspaper claims the midfielder is unlikely to make a mid-season move to Fulham, whose enquiry has been 'all but shut down'. It adds that Milan's agreement contains a €35 million (£30.5 million) option-to-buy Bakayoko, for whom they paid a €5 million (£4.4 million) loan fee a year after his £36 million transfer to Stamford Bridge. Fulham, who are managed by the under-pressure former Chelsea midfielder Slavisa Jokanovic, have utilised close ties with their west London neighbours to acquire loan players like Tomas Kalas and Lucas Piazon in recent campaigns. The Cottagers have particularly struggled defensively upon their top flight return, and landing Bakayoko - who operates primarily as a midfield anchor, could go some way towards addressing that problem. Scott Parker could be offered his first managerial experience if Slavisa Jokanovic is unable to salvage Fulham's season. Jokanovic's job is not under immediate threat despite Fulham losing six in a row, collecting only two points from eight games. Owner Shahid Khan wants to stay loyal to the manager who led his club to promotion but Fulham are bottom of the Premier League and are leaking goals. They have a daunting fixture at Liverpool on Sunday followed by an international break which will provide time to review what has gone wrong after a summer when £100million was spent. Parker has returned this year to Craven Cottage where he ended his playing career and completed his coaching qualifications. He departed at the end of 2016-17 to cut his teeth in charge of Tottenham's Under 18s and was invited back to join Jokanovic's staff as first-team coach in July. The 38-year-old former England midfielder is a popular figure and has been identified by Fulham's hierarchy as a potential future manager. Sam Allardyce, David Moyes, Steve Bruce and Alan Pardew have been linked to the job, but the club would rather maintain a degree of continuity. Fulham are bottom of the Premier League table, having won only once, and travel to Liverpool on Sunday. Jokanovic has not been given any indication he will be sacked if Fulham lose again, but the international break gives the club time to consider their options. Rather than immediately asking a firefighter such as David Moyes or Sam Allardyce to take over, sources close to the club believe Fulham would be more likely to give first-team coach Parker the opportunity to stake his claim. Parker is highly thought of at Craven Cottage and could be given his first management job on an interim basis, while Fulham consider their options. Jokanovic introduced an attractive, passing style that Fulham would be reluctant to ditch by replacing the Serb with Moyes, Allardyce or Steve Bruce, despite their current predicament. Parker has completed his coaching badges and has made no secret of his desire to move into full management, even though he is fully supportive of Jokanovic. It is believed that desire was behind the 38 year-old’s decision to return to Fulham as first-team coach from Tottenham Hotspur, where he was the Under-18s coach. Former midfielder Parker made 128 appearances in three seasons for Fulham after signing from Tottenham in 2013. Other than Moyes and Allardyce, who would be unpopular appointments with many Fulham fans, Claudio Ranieri and Brendan Rodgers have been mentioned as potential successors to Jokanovic. Rodgers, though, would be an expensive choice. Jokanovic is hoping he will be given more time to turn things around at Fulham, following the defeat to relegation rivals Huddersfield Town, and is making plans for the international break even though the situation could rapidly change. Fulham spent more than £100 million on new players during the summer, but finger-pointing has already started over who was responsible for the incoming transfers. Jokanovic’s claims that he recommended signing more players with Premier League experience are undermined by the fact he has not been starting defender Alfie Mawson, despite the fact he joined from Swansea City. Okay so we’re not where we hoped we’d be after 11 Premier League matches, but we’ve taken a little while to get going in previous years, too. We always get better as the season progresses. If you want a case in point, we were 16th in the Championship exactly one year ago today, and look where we ended up. Every summer since Slaviša has been here there has been a significant turnover of personnel on the playing side, and I think that gelling time is why it takes us a little while to get going. It takes time for people to settle in and get used to the way we play. That said, we can’t make excuses for what happened at the John Smith’s Stadium on Monday night. First and foremost in football, you’ve got to show the desire. It doesn’t matter how much good football you play, you’ve also got to have that desire, and we were definitely outfought on Monday. I knew the first 15 or 20 minutes would determine how the game went, and they swarmed us. It’s so annoying when you know you’ve got quality players, yet you under-perform. Cardiff and Huddersfield are favourites, in my book, to go down. Man for man, pound for pound, we’re better than them in nearly every position, so to come away from those two games with no points, and a lack of fight and desire, was really disappointing. I expect that after the disappointment in front of the television cameras in Monday Night Football, the lads will be hurting and wanting to show a response when they’re live on Sky again on Sunday. There are no hiding places in the Premier League. While it’s great to be on telly, if you do under perform like we did in Huddersfield, then the whole nation sees it. We don’t want to be labelled as a team of non-triers. I wouldn’t go as far as to say we were non-triers on Monday, but we didn’t play with the same intensity as Huddersfield, and it cost us. I’m looking forward to the Liverpool game. I’m going to commentate on Leicester v Burnley on Saturday, which is the first match at the King Power Stadium since the accident, so that will be a very poignant occasion. And after that I’m travelling to Liverpool to watch our game as a fan with some friends. Hopefully we can pull something out of the fire – there’s no better game really because all the neutrals will be thinking we’ve already lost it, so we can go into it without any pressure. Liverpool lost to Red Star Belgrade in the Champions League this week, and while some people may see that as a bad thing as they’ll want to bounce back, I look at it as a positive. I think it’s a good time to play them because they had been just getting away with a few results of late, something they didn’t manage against Red Star. Liverpool are a dangerous team to play against, and there’s no better front-three in the country at nicking possession, and indeed the midfield three behind them. For me, they lack a little bit of imagination in midfield, but they’re also one of the best in the division at getting possession back. If you overplay against Liverpool, you will come unstuck. I think they will probably be the main challenger to Man City for the title, although I expect them to fall short because I believe City are the best team and squad by far. In and around the ground, our fans should enjoy the day because they put a lot on in the surrounding area to really try and make it a day for people to remember. I really like the Liverpool fans, I always find them welcoming, and I expect that to be the case on Sunday as there’s no trouble between the two sides. It’s a must-see ground, one every fan should try and tick off. Joe Gomez is in a race against time to be fit for Liverpool’s Premier League clash against Fulham on Sunday, according to the Daily Telegraph. The newspaper claim the defender, who has been one of the Reds’ star performers this season, is struggling with an Achilles injury and did not start the 2-0 Champions League defeat to Red Star Belgrade on Tuesday “as a precaution”. The Telegraph report Gomez will be monitored over the coming days as he nurses his injury and has not given up hope of reclaiming his place in the starting XI for the weekend 12pm kick-off at Anfield. Gomez has been one of Liverpool’s star performers this season and Jurgen Klopp will be eager to reinstate him into the team after he started on the bench in midweek. The 21-year-old was replaced by Joel Matip at centre-back and the team delivered their worst defensive half of the campaign in the opening period. Even the hallowed Virgil van Dijk was way below par. Gomez did come on at half-time against Red Star, replacing Trent Alexander-Arnold at right-back. The England international is highly competent in all defensive positions, but is at his best in the centre of defence, where his partnership with Van Dijk has laid the foundations for Liverpool’s Premier League title challenge. The Merseysiders have quality cover in Matip and Dejan Lovren, who was ill in midweek despite travelling with the squad to Belgrade, but Gomez has now leapfrogged that senior duo to become the favoured partner of main man Van Dijk.